Lush Fab Glam Inspired Lifestyle For The Modern Woman: New Music: First Listen to Rihanna's New Single "We Found Love"! New Music: First Listen to Rihanna's New Single "We Found Love"! 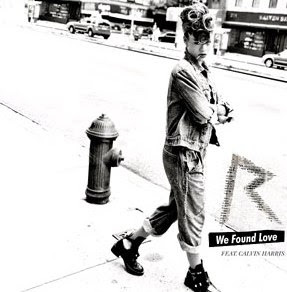 Rihanna 'We Found Love' single cover. What do you think of Rihanna's new single? Leave a comment below. Like her but don't really like this song. Not a fan that sound is in right now so can't blame her for capitalizing on it. omg Riri needs to take a break, and grow as a woman and an artist a mediocre album every year with excessive radio play is just too much! That rihanna reign just won't let up! She's starting too sound and dress like Madonna in the 80s Gaga's already on that train, not sure this will work for her. It's ok it will grow on me, I never like her sounds in the beginning then I find myself singing along lol. Omg I finally get to hear it, some of it , looked for it all over you tube and they've taken them down. And its #1 on itunes yeaaaa!